Enzo Life Sciences continues to expand its ELISA portfolio. A leading manufacturer of high quality ELISAs, Enzo continues to invest in developing immunoassays with the launch of their new Total PSA (human) ELISA Kit. Prostate-specific antigen (PSA), also known as gamma-seminoprotein or kallikrein-3 (KLK3), is a kallikrein-like protease produced by the epithelial cells in the prostate gland, the lining of the urethra, and the bulbourethral gland. It is a single-chain glycoprotein with a molecular weight of about 30-33kDa in human seminal plasma and it functions in the liquefaction of seminal coagulum. Under healthy conditions, very little PSA is secreted in the blood. PSA exists in serum in multiple forms and most PSA is bound to serum proteins. The proteolytic activity of PSA in blood is inhibited by irreversible formation of complexes with proteinase inhibitors such as alpha-1-antichymotrypsin (PSA-ACT complex), alpha-2-macroglobulin (not detected by immunoassays) and other acute phase proteins. A small amount of PSA is not protein bound and is called 'free PSA’, which is proteolytically inactive. Increases in glandular size and tissue damage caused by benign prostatic hypertrophy, prostatitis, or prostate cancer may increase circulating total PSA levels. Monitoring the total PSA level in male blood has been used as an indicator for abnormal prostate function in the past decades. This assay provides an equal molar detection on different forms of PSA in human matrices, which improves the accuracy and sensitivity of the measurement on the total PSA levels. The Total PSA (human) ELISA Kit provides a quantitative, immunometric detection method for measuring Total PSA in serum, plasma, urine, and cell culture supernatants. This ultra-sensitive assay measures as little as 0.287pM (0.024ng/ml) of Total PSA and provides fully quantitative results. The Total PSA (human) ELISA kit is highly specific with no cross reactivity with KLK2 and ACT. With the ability to analyze up to 40 samples in duplicate in 2.5 hours, these kits meet the needs for rapid, high-throughput analysis. Like many other Enzo Life Sciences ELISA kits, the Total PSA (human) ELISA Kit is complete, flexible and thoroughly validated. Enzo Life Sciences ELISA kits are supplied with an easy-to-follow protocol, pre-coated microtiter plate and liquid color-coded reagents to save the user time and reduce errors. The break-apart strip plate design provides flexibility – not having to run all 96-wells at once. Each kit is put through rigorous fit-for-purpose validation and stability testing to ensure high precision, accuracy, sensitivity, and specificity. The release of the Total PSA (human) ELISA Kit is the most recent addition to the Enzo portfolio of products for Inflammation, Cancer, Endocrinology, Urology, and Immunology. 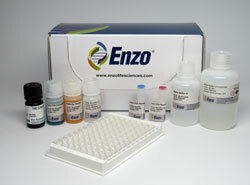 For more information on this ELISA kit or other Enzo Life Sciences products, please visit us at www.enzolifesciences.com or call us at 1-800-942-0430.